If we could tell a film, then why make a film? Renowned Iranian director Jafar Panahi received a 6-year prison sentence and a 20-year ban from filmmaking and conducting interviews with foreign press due to his open support for the opposition party in Iran's 2009 election. In this film, which was shot secretly on an iPhone by Panahi's close friend Mojtaba Mirtahmasb and smuggled into France on a USB stick concealed inside a cake for a last-minute submission to Cannes, Panahi documents his daily life under house arrest as he awaits a decision on his appeal. My inspiration for watching this was a recent viewing of Mohammad Rasoulof’s masterpiece The White Meadows. Jafar Panahi, the subject of this quasi documentary, is a well known and respected Iranian filmmaker who recently lent his hand to Rasoulof’s film as an editor. Rasoulof’s film was released in late 2009, and both Rasoulof and Panahi were arrested, tried, sentenced, and jailed in late 2010 for film related activities, specifically propaganda against the Iranian government. Moreover, aside from their six year sentences, they were both banned from any filmmaking activity for 20 years. I’m struggling to find the words that do this important ‘film’ justice. 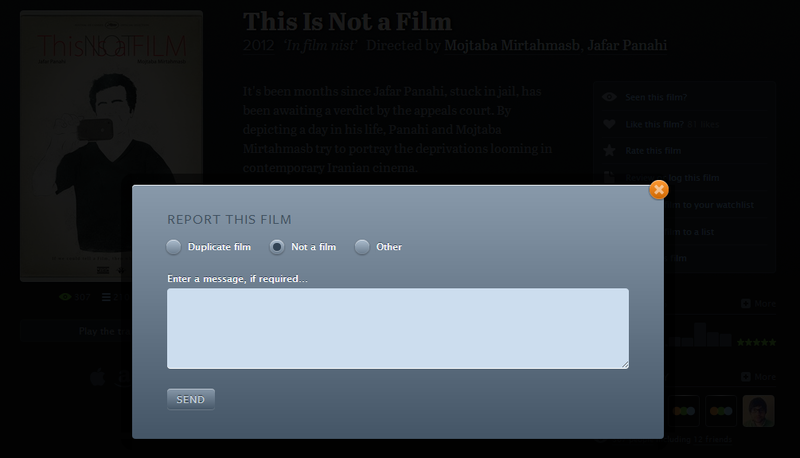 This Is Not a Film is a brave and inspiring documentary about censorship and the the power of cinema itself. Essential viewing. When any government or political entity denies that which is a fundamental human right (regardless of which country it is happening in) we must understand that the crime being committed against one individuals rights extends well beyond that individual.. we ALL pay the price when rights are denied ANYONE! The overall consenus should be that of complete and utter outrage! This may not be the film that Iranian directors Jafar Panahi and Mojtaba Mirtahmasb wanted to create but it is a film that NEEDED to be made! In an understated manner the story unfolded quite organically! On the surface it appeared overly simplistic at first glance but in reality it was truly damning! My rating for this film is not based on how much I enjoyed it or how objectively good it is. It is based on what this documentary represents. Iranian director Panahi was sentenced to 6 years in prison and got a 20 year ban on filmmaking. Exiled in is own appartment he shot this film with his friend using a camera and his Iphone. He managed to smuggle the final result out of Iran on a USB stick hidden in a cake, to have it shown at the Cannes film festival. It's quite staggering that Iranian cinema and its makers have managed to forge such a strong reputation, particularly over the past twenty years, given the social restrictions enforced by the Government. There are strict guidelines to be met when proposing a film in an immense struggle to overcome the censorship laws. Imagine what it could achieve without them. This Is Not a Film made it out of the country on a USB stick smuggled inside a cake due to pending 'criminal' charges hanging over the head of its part creator, director Jafar Panahi. The film was mostly shot by fellow director and friend, Mojtaba Mirtahmasb in Panahi's spacious apartment during the days leading up to his appeal decision. A potent reminder that I really shouldn't take the freedom to make films for granted. The last twenty minutes or so are some of the most gripping I've seen this year. It’s really not because it’s something better. Finding a divide between the infamous history behind a film and the film itself in front of you and being able to determine your thoughts is not always easy. Going in blind This Is Not A Film is of course a protest but that doesn't mean it's an hour of Jafar Panahi lying on the floor moaning about his government. When your governments censorship becomes stifling, do you just cry for them to hear and thrive on, or do you continue to work and think about your bursting creative process? Hitting points of frustration when all you want to do is talk about people and tell stories. I admire Panahi for trying to stay allusive in his circumstances, but now we know: can't be done. Igi is such a strange looking cat..
Jafar Panahi has the biggest balls of any filmmaker I've seen. Can't give this a proper rating, but I also can't stress enough how important this film is. On one of the most chaotic days of celebration in Iran, one that might look like a riot to westerners, Jafar Panahi exhibits a day in the life of a man who's been stripped of his essence. Panahi is appealing against his 20 year ban on filmmaking, screenwriting, or even leaving Iran. What comes out is an incredibly brave effort, that ultimately stems from a couple months of boredom, and a lifetime of frustration. The last 20 minutes are great, the last minute is ASTOUNDING. Good documentary that ends on a devastating, perfect note.